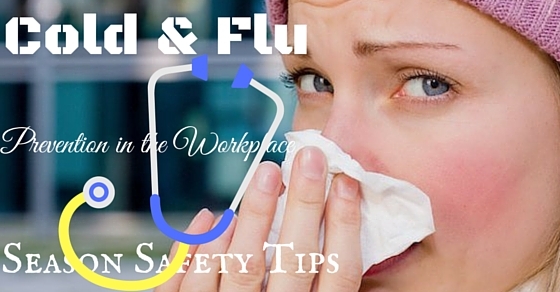 Cold and Flu prevention at the workplace is important, which is caused by the bacteria present in the atmosphere which is highly present from the month of November to April. The cold is often passed from one person to another when both the individual are in the inside environment that is indoors and hence it is passed from one person to another according to the surface in the work area. The people who get infected with the virus in their home, carrying it to the office place affect the other co-workers and people. Later, on for about five days they get infected with the flu as it occurs before any symptoms are developed with the individual. Thus there are some cold and flu prevention tips which can help to take prevention and not spread the cold to other employees in the workplace. One of the best and effective measures of preventing cold and flu in the workplace is that a person should wash their hands with soap properly. It is also suggested that the person should sanitize their hands with a gel hand sanitizer especially if they are in contact with a number of people or any contaminated surfaces. This surface may include hand shake, door knobs, copier machines the keyboard, computer, the elevator button, someone’s food, files, bills, office material and etc. After a person washes their hands they have to close the knob or the faucet of the tap. They should do so by using a paper towel present in the restroom this ensures that the person having cleaned and washed their hands do not get further infected by any germs or bacteria present on the knob of the tap by others and helps even saving the water. After washing the hands the individual should dry their hands by using an air dryer or a paper towel present in the restroom. This helps the person staying clean and away from the bacteria present in the office atmosphere. The heat coming out of the air dryer kills all the germs present on the hands of the person if any. By using a paper towel it prevents the individual from further coming in contact with any other present germs at the time of interaction with other people in the workplace. By washing hands for at least 15 or 20 seconds the germs present on the palm of the hands gets killed and cleaned. It is scientifically proven that by washing hands for a long time instead of just washing for 1 or 2 seconds will increase the chances of accumulating more germs. A paper towel is not necessarily used by an individual to wipe their hands. It also recommended that a paper towel can be used by the person in various ways such as opening the bath room door after using the restroom which helps in preventing the spread of germs causing bacteria of the flu. After using a paper towel the person should also ensure that the paper towel has been disposed in the trash bin present outside the restroom. It is prescribed by some people that while washing hands using a hands sanitizer is effective. After wetting your hands with clean water and after applying the person should then put hand sanitizer on hands and rub them properly between their fingers and nails for a minimum amount of twenty seconds. This helps them coming in minimum contact with any bacteria of the flu present in the workplace while they come in contact with other people and the work surface. After cleaning and washing hands and the face, the person should avoid touching their face a number of times unnecessarily. On touching the eyes or rubbing the nose the germs present spreads faster as they come on the hands hence coming in contact with the other office employees and people present which can also spread the flu. So it is recommended that the person avoid touching their face and other places and stay clean. Though a person wishes to not take a leave from the workplace, it is highly recommended and advisable that when the starting phase of the sickness is getting worse day by day, they should take a leave from the workplace. It is because they will not come in contact with the other healthy office employees and hence they won’t catch the same flu causing virus. So taking a leave at such time is advisable. When a person realizes that they are having or have got certain symptoms which can cause flu or any other disease to them, they need to take an immediate precaution at once so that they do not further worsen the disease and cause harm to their system. In whatever way the person thinks can help in preventing a possible disease should be done by them. A high amount of germs are released from the mouth and nasal area of a person while coughing or sneezing. This in turn leads the germs coming in contact with other healthy individuals in the workplace and thus they get infected with the flu causing virus. So the first person having such a virus needs to cover their mouth and nose when they cough or sneeze even if they are alone or sitting in a group with other people. In every common workplace, when a person forgets to bring their water bottle to work, their other work mate offers them a sip from their bottle which is one of the ways to spread germs from one person to another. So firstly the person should avoid offering water from their bottle to others and should thoroughly wash their water bottle at home daily and not carry the same water the next day as it may contain germs. It is even suggested that the person should ensure that they clean the area they work in on a daily basis. This may include the desk they work on, the table, the chair they sit on, the office equipment they use etc. This will help in keeping the area clean and ensure them that they are staying clean in the environment in the office and not carrying forward any flu causing virus to another individual. One of the most effective ways that a person can stay away from the flu causing virus is by getting a vaccine which can prevent the flu virus from entering their body. By getting a vaccination the flu causing virus will get destroyed before reaching the body parts such as the throat, nose and mouth of the individual and keep them healthy and safe in the work place. Besides an individual, the dirt and unnecessary garbage present in the workplace is one of the main causes for a disease such as the flu. So the office workers should ensure that the garbage in the office is disposed off properly not causing any harm to other employees of the office. For this a proper number of garbage bins needs to be installed and situated in the workplace and segregation of dry and wet garbage should also be done effectively. It is essential that a person who knows about the awareness regarding the flu causing virus and disease, should spread the same information among the office employees. This helps in knowing how deadly the flu virus can be for an individual. The information also provides as a warning to the other employees to take extra special care regarding their health and stay safe at all times so that they can come to work on a daily basis. Recommendation of drinking lots of water and other fluids which restore energy inside the body of a person is prescribed as a way to keep them safe. This helps in fighting any flu causing virus present in the workplace along with any virus present in themselves. By drinking water they stay fresh and energized in the work place and the flu causing virus is eliminated from their system. A person should avoid using any of the other office equipments of the other employees such as their mobile or telephone, their desk chair or any of their personal belongings. By doing so they stay away from any of the viruses present in the atmosphere and do not emit any of the germs present in themselves (if any). So other employees also do not contract them and they safe in the work place. If a person wishes to stay safe everyday in the workplace, they need to take care of their own health. The best way of doing so would be exercising on a regular basis so that they stay fresh and fit everyday to work in the office. With staying fit they also stay away from any virus present in the atmosphere and do not contract any disease which will make them weak. So exercising is the best way from staying away from the flu causing virus. A person should take care of themselves by eating the appropriate food stuffs such as fruits, vegetables, grains etc. This will ensure them staying healthy and not coming in contact or contracting any virus diseases present in the environment. The person should also stay away form consumption of alcohol or smoking which worsens their condition, causing them to contract a flu virus in turn giving it to the other office employees. It is prescribed that if any individual has a certain symptom which may lead to getting flu, they should consider taking an antibiotic. They help in action on certain infections caused by bacteria. This will help the person to heal faster or avoid worsening their own condition by which they will stay healthy on a daily basis and start working efficiently every day. Vitamin C is highly proven efficient for every individual who has come in contact with a flu disease. It helps in reducing certain cold causing symptoms and will also help in minimizing and reducing the illness. Vitamin C can come in the form of tablets or can come in the form of foodstuffs a rich source in Vitamin C.
Stress is regarded as one of the causes for a person contracting a disease. It is highly recommended that a person shouldn’t take stress in the work environment so that they may not come in contact with a cold. If they already have a flu and are staying at home, they should avoid doing any activity whether it is physically or emotionally. This causes them stress which may delay their recovery from the disease and cause a drain on their immune system.So stress is also a part of the cold and flu prevention process. This is recommended for a person who has or hasn’t contracted a flu or cold. When a person comes from the workplace they need to get plenty of rest daily so that they avoid coming in contact with any diseases. When they have caught the flu they at least need to take 7-9 hours every night so that they can recover quickly from any disease they have and recover quickly. So when a person has the flu or cold, they need to take cold and flu prevention at the initial stage so that they may not worsen their condition or give the disease to the other co-workers. This will help them in staying healthy.